In the year 1972, one year after the inception of the sovereign Bangladesh through a liberation war held in 1971, Bangladesh Mathematical Society(BMS) was founded by a group of reputed mathematicians of the newly born country with the leadership of Prof. Dr. S.M.Azizul Haque, the then Head of the Department of Mathematics, Dhaka University. Initially an ad-hoc committee was formed for the Society with Prof. Haque as president and Dr. Sheikh Sohrabuddin as the convener. A constitution for the Society was drafted in the same year which later in 1974 was confirmed by the first Annual General Meeting (AGM) of the members of the Society. A complete Executive Committee for the period of 1973-1974 was formed by an election. This process of electing Executive Committee for a period of two years is a regular phenomenon of the Society. 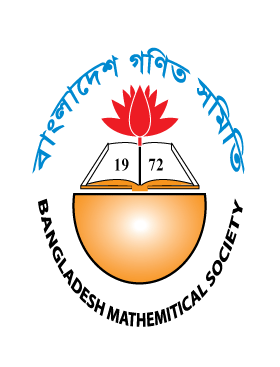 The prime goal of Bangladesh Mathematical Society (BMS) is to promote mathematics education in Bangladesh at all levels from school to university. Another goal of BMS is to enhance research work in pure and applied mathematics as well as other mathematical sciences. The Society has thus played great role from time to time in updating the school text books and formulating standard mathematics curriculum at school levels. BMS has also undertaken training programs for teachers at college and university-college levels. BMS also organizes various seminars on mathematics teaching and mathematics education occasionally. Besides, BMS organizes International Conferences in every two years at different university’s of Bangladesh on different areas of mathematics. BMS publishes two periodicals every year. One of them is “Ganit Prorikroma” which is treated as the spokesman of the Society and which is published in Bengali. The other one is a research journal in English named “GANIT” which publishes only original research work. BMS has its permanent office in the Department of Mathematics, University of Dhaka, Dhaka- 1000, Bangladesh. Any personnel of the Executive Committee may be contacted in the above mentioned address or through the following email address. New executive committees have started their operation.